Nantes is a wonderful place to live and study, and an equally wonderful place to eat. I’ve had many great meals at crêperies, French restaurants, boulangeries, Italian restaurants, farmer’s markets, Indian restaurants, Japanese restaurants and at my host family’s home. 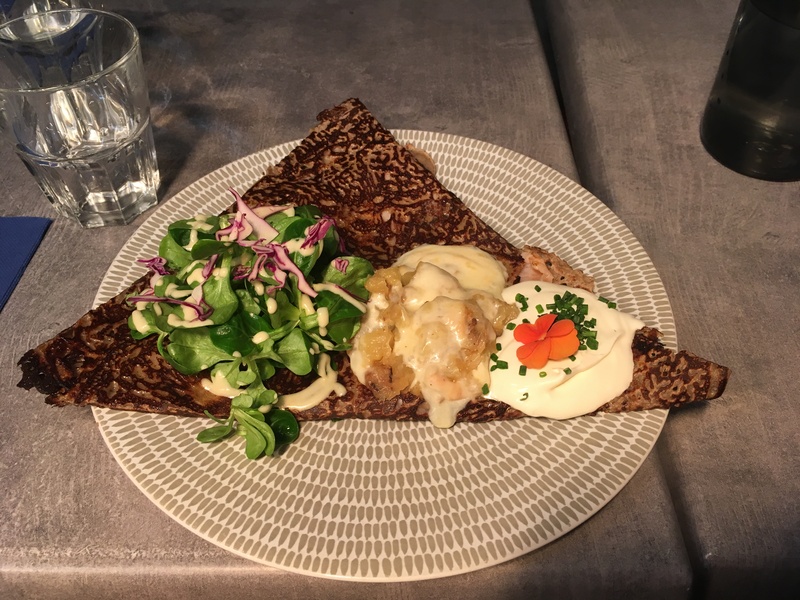 While I’ve tried a whole lot of great things, I would still consider myself a beginner when it comes both to gastronomical expertise as well as Nantes-specific cuisine. Still, I wanted to compile a list of foods that I’ve enjoyed and that have been unique to this place. So, here is a by-no-means-complete list of some foods (and drinks) you will find in Nantes, in my experience. For authenticity, I didn’t include anything on the list that I haven’t tried myself. 1. Mâche (lamb’s lettuce): This is a leafy vegetable originate to Brittany. [Note: while Nantes is no longer technically a part of Brittany, much of the Breton cuisine remains and is now Nantais cuisine as well]. It has small dark green leaves that are usually served still attached to the stem with a few other leaves (but the stem is equally mild and soft). This vegetable can be found by itself in salads, in galettes with other ingredients, in sandwiches, or as any kind of side dish at a restaurant. It pairs well with other types of lettuce and many different flavors. I think it has quickly become one of my favorite vegetables. 2. Beurre demi-sel: This is a product used liberally throughout Brittany. It is “semi-salted butter” but it is quite salty. Bretons (and Nantais) love to put it on everything—savory galettes, sweet crepes, toast, when cooking, and much more. According to my host mom, Parisians are generally not huge proponents of this salted butter. In the United States as well, while I always enjoy salted butter, many of my friends are used to unsalted (sweet) butter, and the idea of this dairy product with salt in it was at first a bit unnerving. Nonetheless, it is butter, so it is delicious in everything. 3. Lotte: This is monkfish, a white meat that on your plate closely resembles cod, but when you search pictures on google closely resembles a mythical creature. Anyways, it is a light, flaky, white fish that can be paired with many different sauces and is usually served as the entrée. When my parents visited Nantes, my host mother made a dish of lotte with a curry sauce and vegetables. The flavor isn’t overpowering, so it can take the backseat to other tastes in the dish. 4. Galettes: These are another specialty of Brittany/Nantes that I’ve referenced in other posts. Galettes look a lot like crêpes, except they’re made with a different kind of wheat, called black wheat (blé noir). So, galettes have a different taste from crêpes—they’re the savory cousins. They’re generally the main dish of a meal, filled with ham, cheese, egg, mushroom, vegetables, smoked salmon, or some combination of everything. Crêpes are then reserved for holding more sweet entities for dessert. 5. Gateau Nantais: This specialty cake of the region is something my host mother served me one of my first days here. It is a soft white pound cake with a little bit of rum and sometimes lemon inside. The top of the cake has a thin white glaze also made with rum or with orange blossom water for flavoring. It is quite sweet with a very fragrant taste, perfect for savoring. 6. Cider: A staple of Brittany, this sparkling beverage can be either sweet or dry. It is the drink of choice with galettes, and with many other meals. It can every color from very pale to very deep golden. Cider is made locally from apples in the Brittany region. The sweet cider is typically less than 3% vol. and usually paired with desserts. The dry version is typically more than 4% vol. and is the one often served with galettes. In traditional Breton restaurants, cider might be served in a bolée (bowl of sorts—but moreso resembling a wide mug), as this was the traditional serving method. (Thanks, Brittany Tourism, for some of this factual information). 7. Kouign-amann: This pastry is full of butter, flour, sugar. The name, in fact, comes from the Breton (a celtic language of Brittany) terms for “butter” and “cake”. It’s made of many layers in a circular shape, making it quite dense. For our March birthday celebration at IES Abroad, we each had a kouign-amann! 8. Pain au chocolat: It is true that you will find this delicious pastry throughout France (and probably in Belgium, Switzerland, and other neighboring countries too). But, the name for this pastry changes depending where you are. Here in Nantes, it is called a pain au chocolat. But, there is a massive debate about the name because in Paris (the biggest rival), they call it a chocolatine. So, while you will find a croissant wrapped around a bar or two of chocolate in a square shape almost everywhere, pain au chocolats are only found in a specific region of France. Upon doing some research, I’ve learned that there are even more names than two for this treat within France, and in each country that makes them there is a unique name as well (ex: in Spain, they’re called napolitanas, as in from Naples). 9. Muscadet: The Loire Valley is the white wine-producing region of France. Whereas you may find red wine in Bordeaux and Champagne in…Champagne, white wines are in the more northern vineyards of France. Muscadet is a specific kind of white wine made very close to Nantes. The name, apparently, comes from a musk-like taste in the wine, even though some wine experts say that Muscadet doesn’t have much of a musk-like taste after all. When we went as a group to Clisson, we visited a vineyard and had a wine tasting where we tried three different types of white wine, all of which were Muscadet. I’m not a die-hard wine drinker, so it all tasted the same to me, but I trust that it is special.